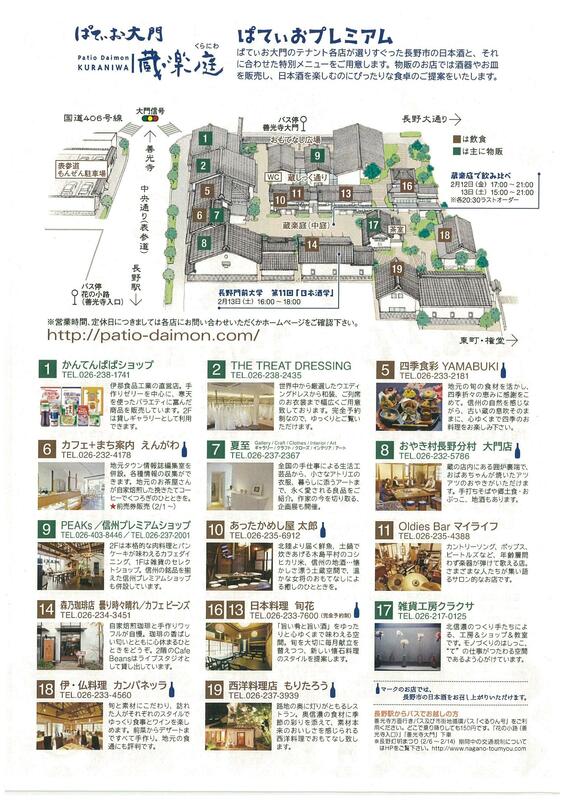 Come have a taste of the local sake from Nagano City at Patio Daimon Kuraniwa located along the street leading up to Zenkoji Temple. 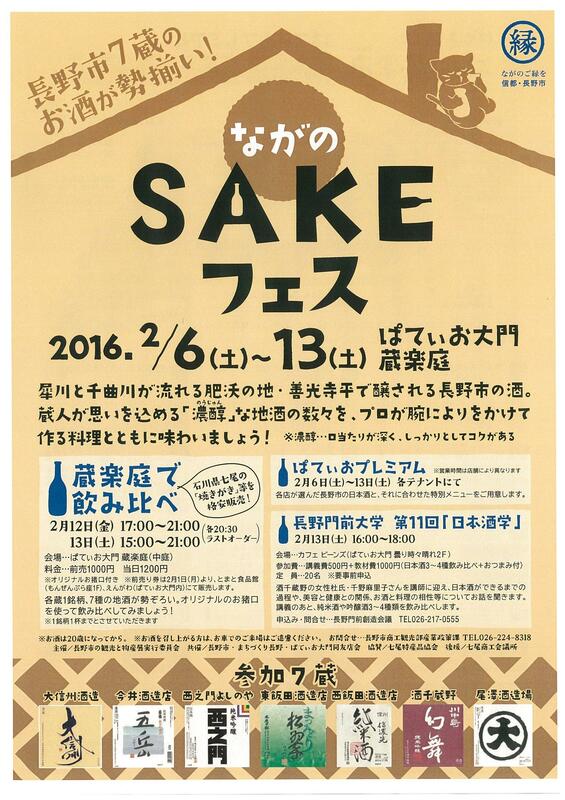 All of the shops there have prepared special menus to pair with the local brands brought to you by Sakagura! Please see the flier below for shop locations. Receive your own special edition sake cup and taste test sake from up to 7 different sake breweries in the Patio Daimon Square. Light snacks are included! The event will be held outside, so please dress warm. Tickets can be purchased in advance for ￥1,000 at Engawa (Patio Daimon - building #6 on the map) or Tomato Supermarket (Monzen Plaza 1st Floor) from 2/1 (Mon). The price for tickets on the day-of is ￥1,200. ※Alcohol will only be served to those 20 years of age and older. ※Driving after drinking is prohibited. For questions, please contact the Nagano City Industrial Policy Section at 026-224-8318 (Japanese only). More information about the Nagano Prefecture Disaster Prevention Drills and Nagano City International Exchange Meeting on Saturday, January 30, 2016 is now available here in English, Chinese, Portuguese, Tagalog, and Thai. 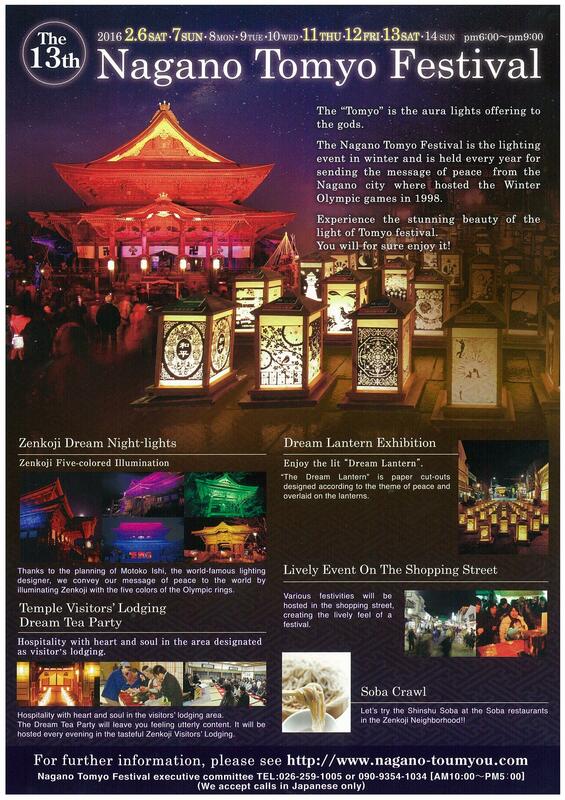 Nagano City's Lantern Festival will be held Saturday, February 6 through Sunday, February 14 at Zenkoji Temple. In addition to the light up of Zenkoji temple, the street will be lined with hand cut paper lanterns and booths will be selling treats and amazake. Sanadamaru follows the story of Sanada Yukimura (originally Sanada Nobushige), head of the Sanada Clan at the start of the turbulent Sengoku Warring States Period. 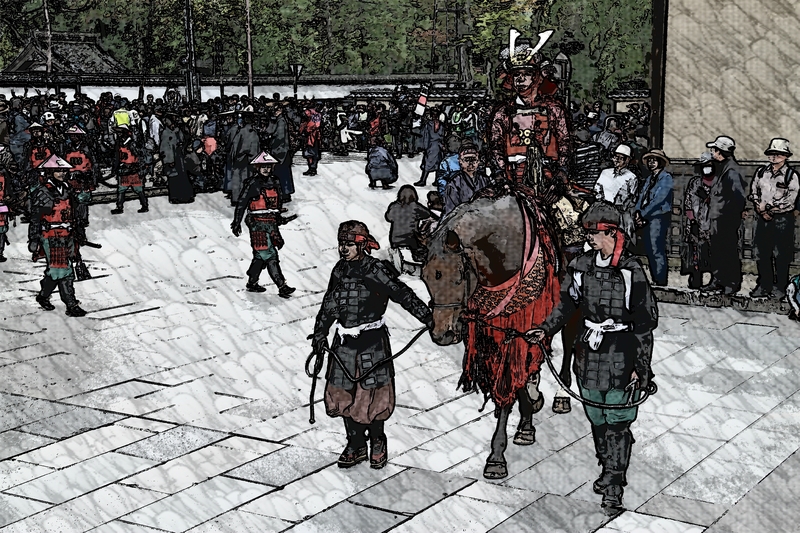 Yukimura is well known for his role as general during the Siege of Osaka. Residing in what is now the present day Matsushiro area of Nagano City, the Sanada Clan, then a middle class family, played a significant role in the history of Shinano Province. This drama follows the story of the family as they fight to survive during the period of chaos. It airs every Sunday at 8PM on the NHK channel on regular cable and 6PM on the BS Premium NHK channel. You can catch reruns of the previous week's episode on the following Saturday. 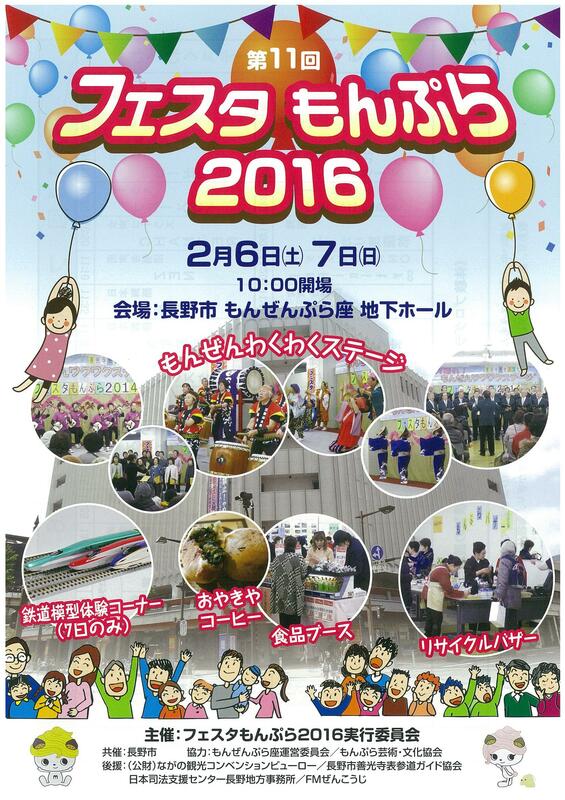 The 2016 Monpura Festa will be held Saturday, February 6 and Sunday, February 7 in the basement of Nagano City's Monzen Plaza. The Festa will feature numerous musical and dance performances as wellas a model trains display, snack booths, and a flea market. Please see the flier pictured below for more information.